This chest, dated 1821, was brought to “Madison:Visskonsin” by S.A. Bolstad who hand-lettered his name and destination on the back panel. Although little is known about Bolstad, we do know that this piece was one of the first furnishings acquired for local tourist attraction Little Norway. The rosemaled design on the chest, attributed to artist Per Lysne, was likely added at the time of that acquisition. 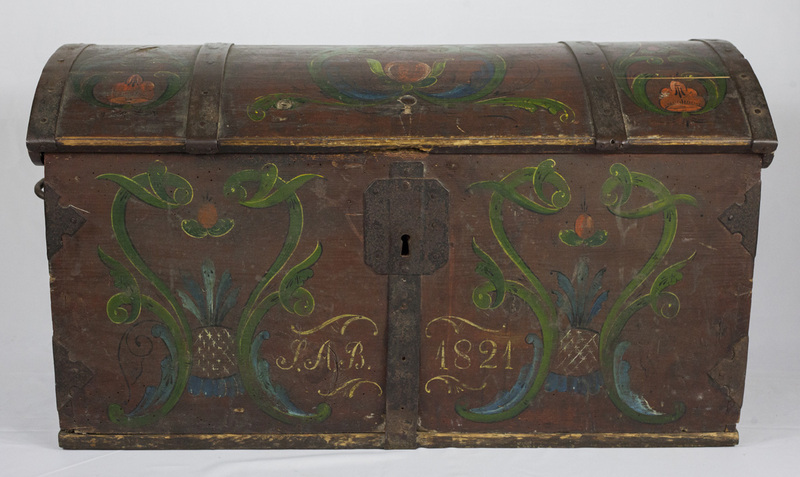 Little Norway displayed the chest for more than 80 years. Creators, Collectors & Communities by Mount Horeb Area Historical Society is licensed under a Creative Commons Attribution 4.0 International License, except where otherwise noted.